Multiple Authors • 10 article s • $11.95 • Item # VB144 Get 10 of our best and most popular training articles and presented so you can start your program now! Circuit training offers an endless variety of training possibilities. 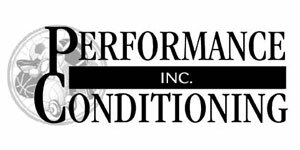 The purpose of volleyball-specific conditioning circuits is to combine volleyball skill(s) with athletic skill(s) development. The emphasis can be placed along the continuum from volleyball skills emphasis to athletic skill emphasis or anywhere in between that is based on the individual needs of the athlete, time of the year and other practice/competition variables. Circuit can also be done to develop athletic skills such as strength and power without implementing the volleyball skill aspect. A circuit is defined as a group of exercises performed in succession. A specific exercise is performed at a station. A series of stations comprise the circuit. After rest, a circuit can be repeated. A circuit has several training variables. By changing the variables of: choice of exercise, order in which they are performed, how many times each exercise is repeated, how difficult the exercise or the tempo it is performed at and the rest involved, factored together, accomplishes the desired training effect. 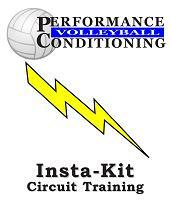 This Insta-kit focuses on volleyball-specific circuit training.